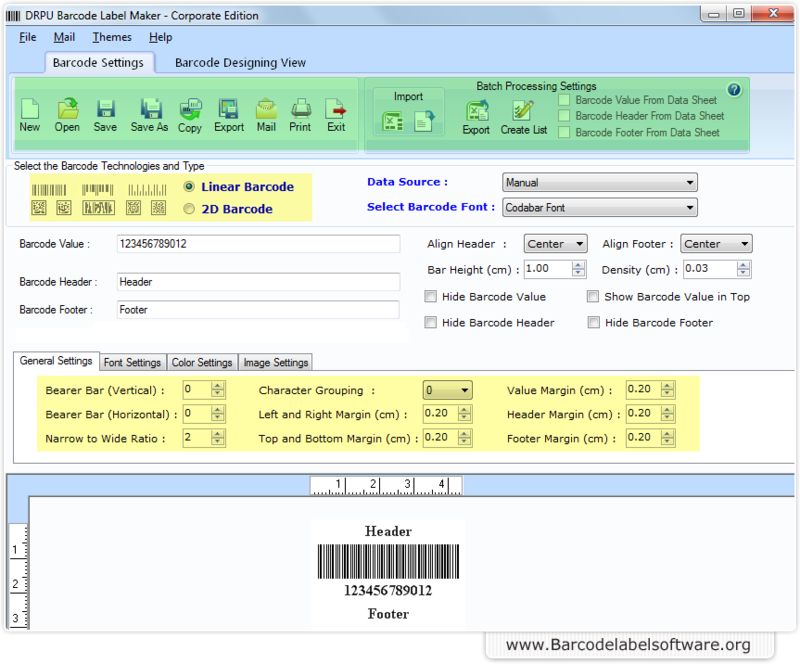 Barcode Label maker software provides easy way to generate Linear and 2D barcode with the help of advance designing objects. Software is incorporated with inbuilt email settings feature to create stickers, rolls and coupons in few clicks. Barcode Software has advance print settings option to use Predefine Label Stock mode or set properties manually. Software also provides option to save custom settings of printing for future reference. Corporate Barcode Label Design Software supports all major Label Products like Ace Label, A-ONE, APLI, Avery A4, Avery US Letter, Avery Zweckform, C-Line Products Inc., Compu Label, Formtec, Herlitz PBS AGHerma, Hisago and INETA, S.A etc. User can draw customize labels, stickers and coupons using different image designing objects (line, pencils, pictures, texts etc). With the help of advance printing setting options users can print series of barcode rolls, ribbons and coupons on single paper sheet. Software supports all major linear and 2d barcode fonts symbologies to generate different types of stickers, labels and assets. Software has inbuilt email settings features to send generated barcode, tags, stickers and ribbons to individual or group of recipient at their specified email ids. Software provides option to create customized as well as standardized barcode labels using different setting including General settings, Font settings, Color settings and Image settings. Software provides an option to save generated barcode images in different file formats (PNG, JPEG, Bitmap, WMF, TIFF, EMF and GIF). Barcode Design Software generates rolls and coupons that can be copied and paste at different Windows applications including MS-Word, MS-Excel, MS-Paint, MS Power Point etc. Barcode maker software also provides an option to generate barcode labels using advance color settings option. Barcode creator software provides an option to import barcode list that is saved in .txt file, .html file and .xls file format at specified location on the system. Software supports all major Linear and 2D barcode font standards. Linear barcode font standards like Codabar , Code 11, Code 128, Code 128 Set A, Code 128 Set B, Code 128 Set C, Code 93, Code 39, Code 39 Full ASCII, EAN 8, EAN 13, Industrial 2 of 5, Interleaved 2 of 5, ISBN-13, ITF-14, LOGMARS, MSI Plessey, PLANET, POSTNET, UCC/EAN-128, Standard 2 of 5, UPCA, UPCE, USPS Sack Label, USPS Tray Label, USS-93, Telepen etc. 2D barcode standards like Databar, Databar Code 128, Databar Code 128 Set A, Databar Code 128 Set B, Databar Code 128 Set C, Databar Limited, Databar Expanded, Databar Stacked, Databar Truncated, Databar Stacked Omni, Databar EAN 8, Databar EAN 13, Databar MicroPDF417, Databar PDF417, Databar UPCA, Databar UPCE, Aztec, PDF417, MICR, DataMatrix, MaxiCode, QR Code Font.